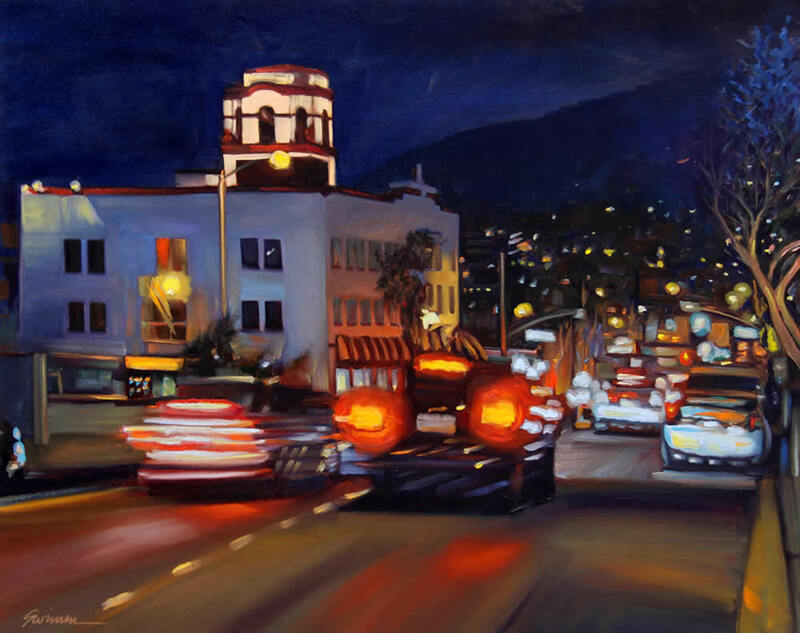 “Hot Laguna Night” as depicted by artist Tom Swimm of San Clemente. The newest juried show “August Nights,” by members of the Laguna Plein Air Painters Association, opens with a 5-8 p.m. public reception Saturday, Aug. 12, at the Forest & Ocean Gallery in Laguna Beach. The award winning paintings and artists will be announced at 6:30 p.m. and on display until Aug. 28. The Sawdust Artists Benevolence Fund, a source of financial assistance for Laguna Beach artists in need, will host its 31st annual art auction Sunday, Aug. 13. A silent auction will be held in the Healy House at the Sawdust Art & Craft Festival at 10 a.m. followed by a live auction on the main deck, beginning at 1 p.m. The day before, art collectors can place bids on a travel themed collection of works by Festival of Arts’ exhibitors through 2 p.m. Saturday Aug. 12. Winning bidders will be contacted and purchases must be completed by 3:30 p.m. Bids can be made at the displays and through [email protected] or call 949 612-1949. 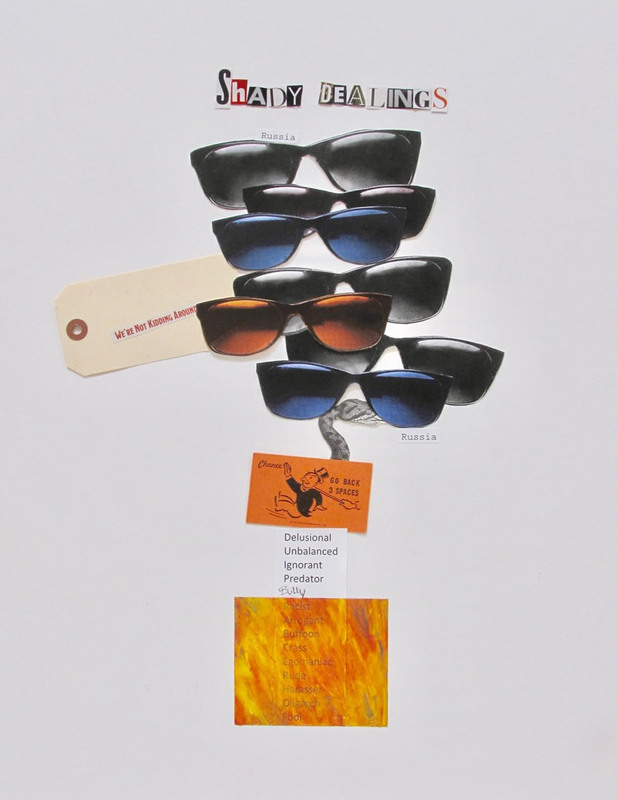 Proceeds benefit The Artists Fund, providing hardship and disaster relief grants for artists in need. 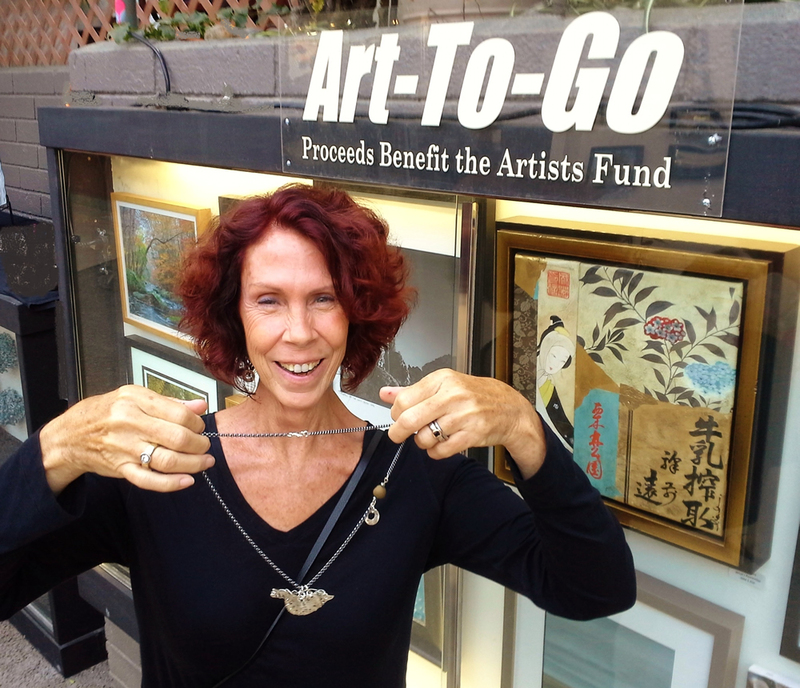 Festival of Arts jewelry artist Kate Cohen displays her donation to Art-to-Go benefit. Artists in the “Women OnWord” exhibit at BC Space, 235 Forest Ave., will read their artworks about the Trump era at 7 p.m. Wednesday, Aug. 16. A donation of $5 is requested and a selection of the readings will be available for purchase. The juried exhibition of 60 works runs through Sept. 30 in the CAP Gallery, 260 Ocean Ave.
Tom Swimm took first place with “Point Lobos Grandeur.” Second prize went to Fernando Micheli for “Batequitos Lagoon Evening.” And third was given to Kirsten Anderson for “Eucalyptus Glow”. 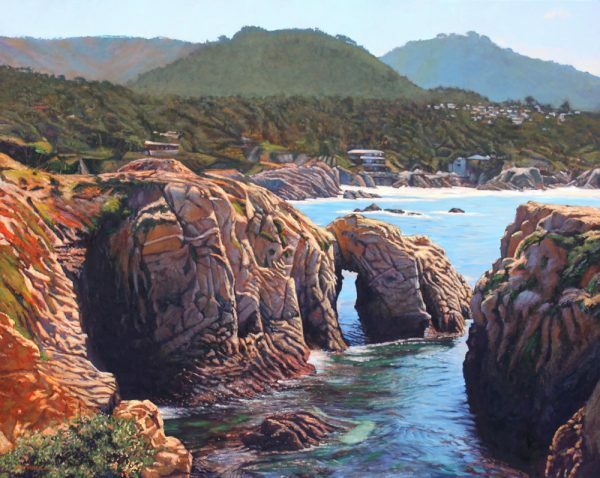 Swimm’s winning work depicting Point Lobos. Gallery Q at The Susi Q was recently awarded a $2,000 grant from the Festival of Arts Foundation to showcase and encourage the work of emerging, semi-professional and professional senior artists in Laguna Beach. Gallery Q is located in The Susi Q, 380 Third St., home to Laguna Beach Seniors, which offers programs and services that promote independence, wellness, and community. The gallery exhibition “ARTopia” runs through Sept. 8. It comprises over 50 works in varying mediums. “Dreamscapes,” oil paintings on canvas by Ann Kim, will be featured at Sandstone Gallery, 384-A N Coast Highway, through Sept. 4. Other exhibiting artists are Scottie Flamm, Susan Gale, Sunny Kim, Dominique McKenzie, Anne Moore, Hyatt Moore, Marie-Pierre Philippe, Jong Ro, and Lynn Welker.